Ciao Milano | Where is Whitney? This April I was working on a project for my freelance client Kenneth, who was living in Milan. He kept on sending me beautiful photos and told me I should visit. Anyone who knows me knows that if you invite me to visit, I will! But I had already taken my friend Bill (Music and Austin Manor) up on an invite to Austin for Memorial Day weekend (more on that trip, Flipside and Burns in general coming later) so I knew I needed to have those trips spaced far enough apart to A.) Get my act together and B.) Not tick off everyone at my day-job. July turned out to be the perfect time. 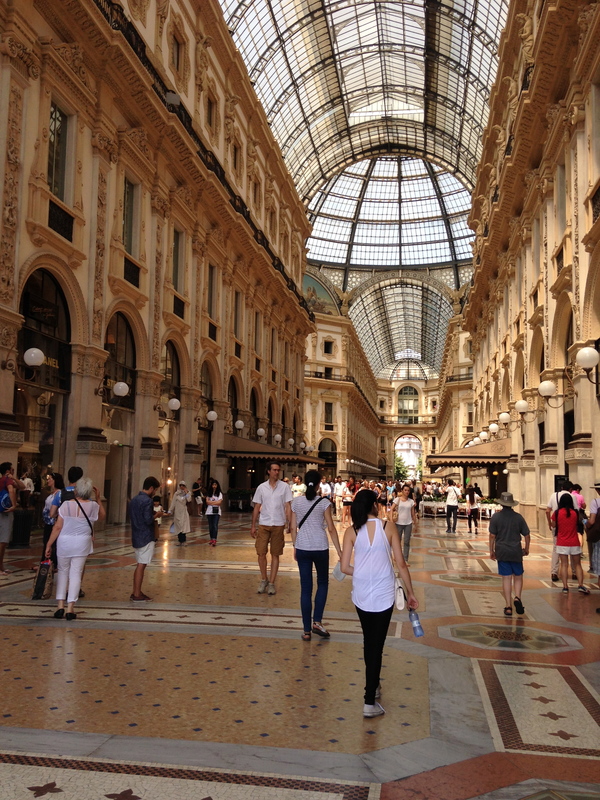 I was able to secure round-trip tickets to Milan for under $1,000. 3.) I get more points if I use the card at the airport or on flights. So because I knew I wanted to go to Italy, I bought the flight to Austin to get extra points for an international flight. 4.) Use flex-dates when booking flights. There’s a calendar on the airline website that shows you which days use the less points. 5.) I don’t check luggage. Ponder this: everywhere on earth people do laundry. I also pack sleep in daywear such as leggings, athletic shorts and jersey knit dresses. I actually did a photo-shoot in the same dress I slept in! I was actually very stressed before leaving for Milan. My passport didn’t come in the mail until three days before my flight. I was a nervous wreck. My flight was long. I bought my train ticket to Milan. I got off at Milano Centrale. It was the most beautiful ornate transportation station I had ever seen, but the wrong one! I wandered around for about an hour until I found out through a combination of graphic icons (I have a new appreciation for those!) and broken English that I needed to take the metro. I finally met Kenneth at the correct station and we took two buses to the place he is staying. When I travel I don’t stay in a hotel. From the outside it doesn’t look like much. Just an old industrial building, but when you open the gate you walk into a large courtyard filled with grass, plants and pathways. It’s a retreat from the urban environment. The apartment itself looks like a gallery – it was beautiful with a super open floor plan, very modern design. All the windows stayed open. It was pretty hot and no one had A/C. I was exhausted, I tried to stay up, but by the afternoon I had crashed under the mosquito net. That night we rode bicycles to the supermarket. Kenneth pointed out all the exotic food that isn’t normally available in the United States such as mozzarella di bufala and this giant crawfish type creature. That night I indulged in red wine and home cooked food on the patio. I save on money and gain on experience by not staying in hotels when I travel. I stay with a host, or in a hostel. In the U.S. I camp quite a bit too. I also save restaurants for special outings and I eat from grocery stores, produce stands and bakeries. I also carry my own water bottle. In Italy, I loved the bakeries I could get pizza and other goodies without having to wait. The services at restaurants is so slow! I preferred to order at a counter and eat in a park. Kenneth also gave me a great tip on saving money. Don’t do currency conversion. Just go to the Bancomat (ATM) and withdraw a good chunk of change. You’ll only get charged a flat fee that one time. Don’t use your card, because you’ll get charged each time you make a purchase. 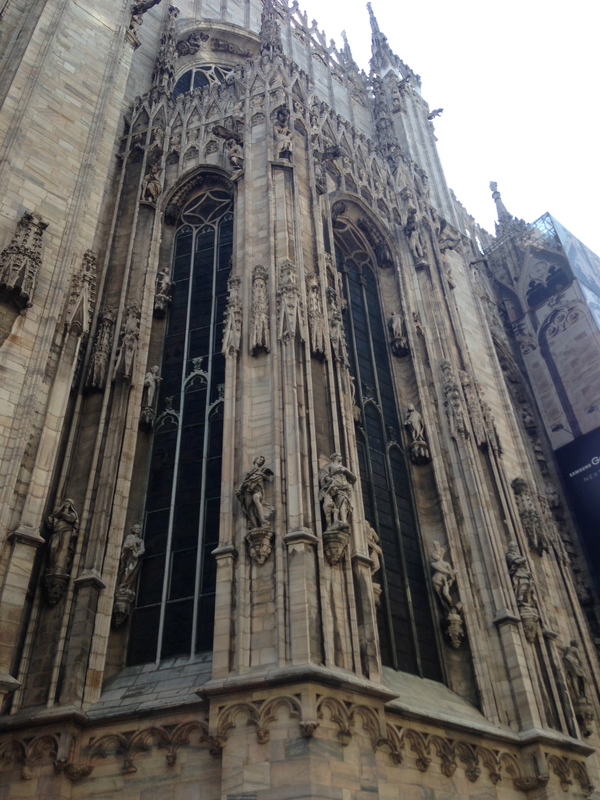 Every town in Italy has a Duomo, just like every town in the U.S. has a First Baptist. 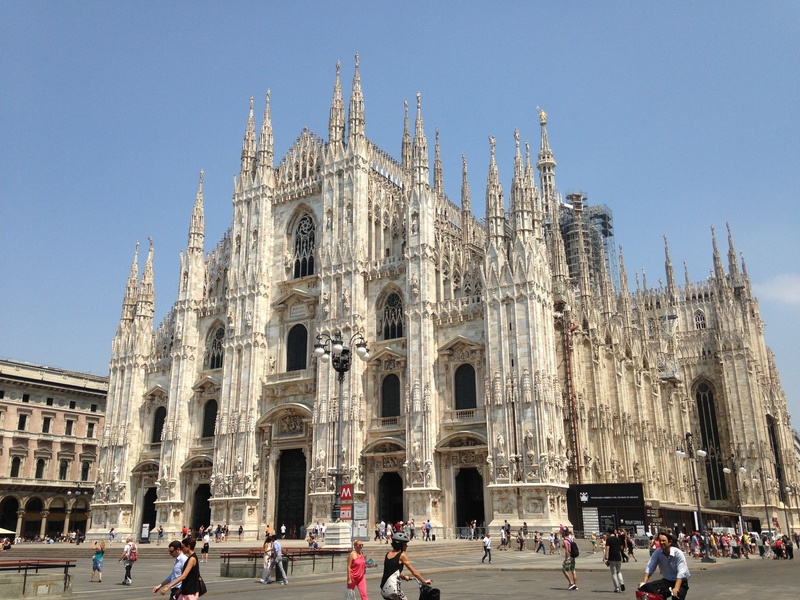 My second day in Milan I ventured to Duomo Milano. 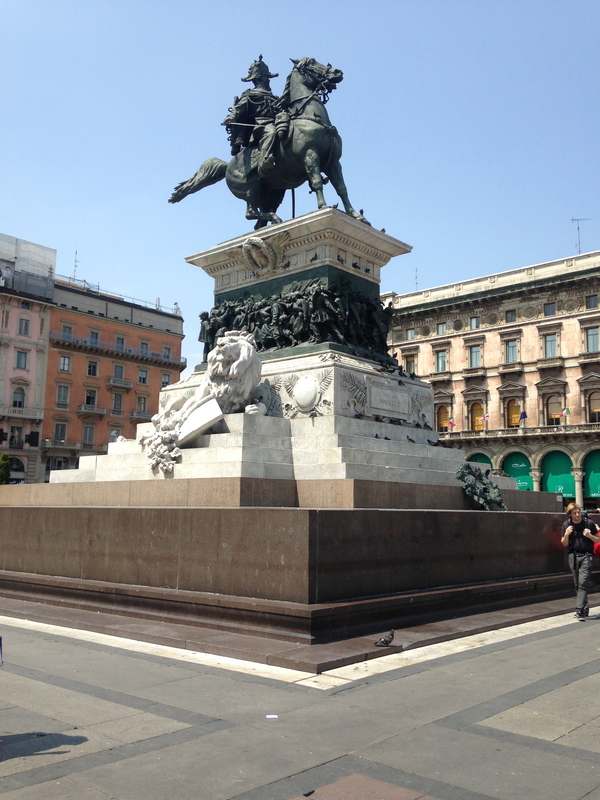 It’s in a huge square next with a historic mall called Galleria Vittorio Emanuele II on one side and a giant horse statue of Vittorio Emanuele II in the middle. I must have really stood out as a tourist in my shorts and tennis shoes, because next thing you know someone had put birdseed in my hand and asked to take my photo while all the pigeons flew over. Me being as naive as I am thought, oh what a nice guy to give me bird seed. No, he wanted my money. I didn’t have any euros yet though, (yes no queens) so the confused Indian immigrant was paid in quarters. 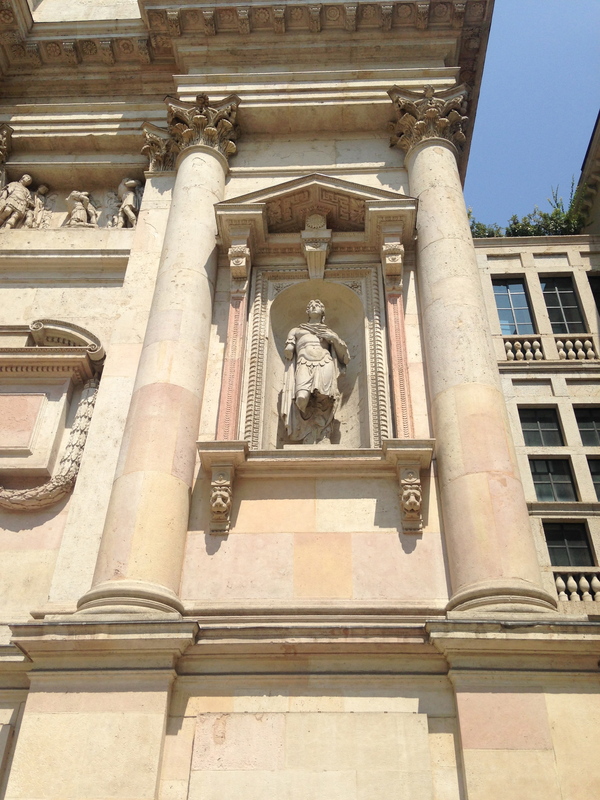 After seeing extremely ornate Duomo and Galleria I walked to Castello Sforzesco. Outside the castle was a large fountain where everyone was hanging out cooling off from the heat. The castle was pretty interesting, there was a museum with antiques and art inside. On the other side of the castle was a beautiful public park, Parco Sempione. People in Italy are really different from Americans in public parks – there is so much PDA. The park had lots of couples lying around snuggling, kissing – nothing profane, but definitely beyond what’s considered appropriate in the U.S. I got hollered at by African immigrants in English. I don’t respond to cat calls whether in the U.S. or abroad, but it was kinda funny to think about how they couldn’t know whether I could even understand them or not. On the other side of the park was Porta Sempione the famous arches. I always remembered seeing them on placemats at Italian restaurants. I couldn’t believe I was just stumbling up on them unplanned now. I love taking pictures of sculptures of people, especially all these powerful ladies. I mean it was so long ago, but the romans were carving up some pretty inspirational ladies. One day I walked to Fondazione Prada. It was filled with some of the coolest exhibits! One was an exhibit on historic replicas of famous historic sculptures. One was this really amazing cave sculpture Processo Grottesco made out of cardboard. There was a ton of modern art and a cafe called Bar Luce created by Wes Anderson as some sort of installation. That same day Kenneth hosted a dinner party. It was really special, but also really awkward because I don’t speak Italian and none of the guests spoke English well. I surprised myself though at my Spanish-speaking abilities! Two other women spoke Spanish, one had studied abroad in Spain and one had lived in Argentina. Hahaha! We talked about culture, politics and … Argentinian men. I had a few other evening outings while I was hanging around Milan. Kenneth and I bicycled to where the canals are. Apparently Milan used to be like Venice as far as being filled with canals, Mussolini filled them in. One of Kenneth’s daughters works at a bar near the canal area. The apple doesn’t fall too far from the tree, she wanted sushi, so she flew to Japan! It’s a big nightlife spot. The funny thing though was that there were so many people just hanging out drinking outside. Obviously loitering and open containers are not illegal in Italy! Untouristic and Artistic Photoshoot Milan was the name of the event. Even if I don’t need a place to stay I like get on Couchsurfing and see what’s going on while traveling. It’s a very social group and events are regularly scheduled in most large cities. I found this photoshoot event and was curious to find out what it was about. The event was a photographer who wanted to practice his photography skills in cool historic sites. We mostly hung around this historic university. He was a terrible flirt though! I got the pictures back and about half of them were of me giving him the side-eye! 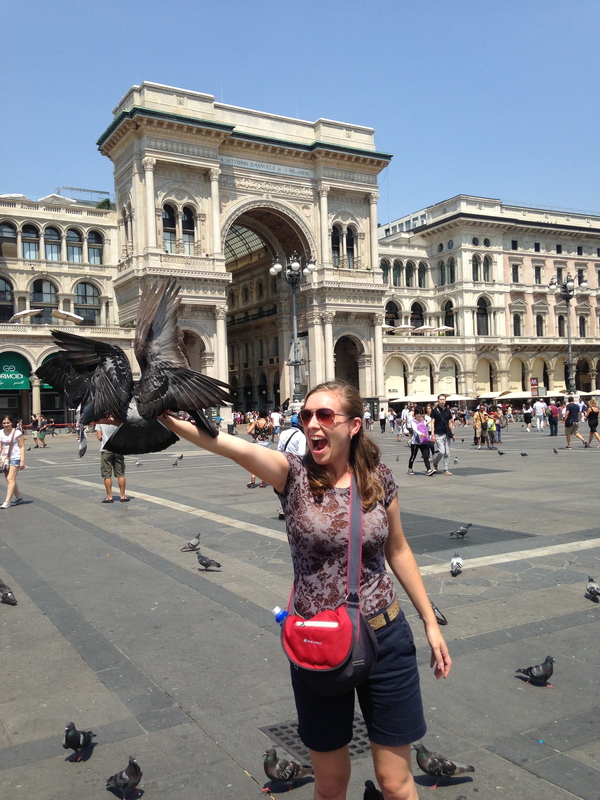 Milan was a ton of fun, but soon I moved on to visit other regions. More on those later! Pingback: Lago di Como | Where is Whitney?